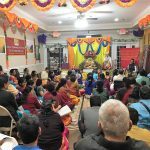 The eighth annual Namadwaar Madhura Utsav and Srimad Bhagavata Katha was celebrated joyfully by devotees from Houston and all around the USA from December 18 to 27, 2015. 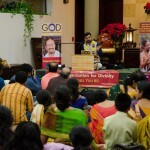 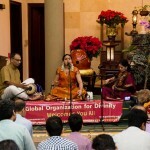 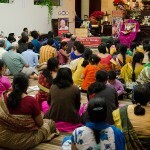 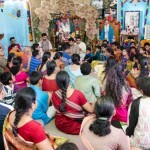 Organized by Global Organization for Divinity, the unique celebration drew over 250 devotees from Houston and across the USA including Boston, Virginia, Atlanta, Minneapolis, California, Dallas, and Canada. 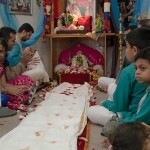 Under the guidance of Sri Ramanujamji, disciple of HH Sri Sri Muralidhara Swamiji, the 10-day celebration had one focus point – love for Lord Krishna-Sri Radha Devi. 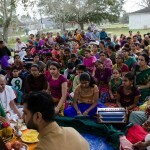 This year was special too because it was the first celebration at Namadwaar for the newly-arrived utsav murthis of Sri Premika Varadan-Sri Madhuri Sakhi (Sri Krishna-Radha) who have been sent lovingly by HH Sri Sri Muralidhara Swamiji to make Houston Namadwaar their home and shower Their grace on all devotees here. 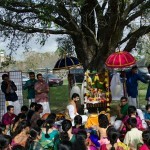 The uniqueness about this annual celebration is that, as it is based on the devotees’ bhavam or mood towards the Lord, no two years’ events are exactly alike and always has new and fresh elements every year. 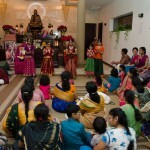 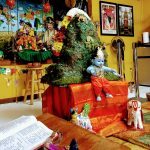 Highlight events this year were Madhurasmriti, a sharing of sweet memories and teachings of the Guru by Sri Ramanujamji; special Pada puja to Sri Radha Devi; special abhishekam to Sri Premika Varadan-Madhuri Sakhi on Vaikunta Ekadasi followed by a moving Bhagavad Gita parayanam for Gita Jayanti celebration that culminated in a number of ‘sharanagati’ kirtans signifying Sri Krishna’s command to Arjuna of “sarva dharmAn parityajya mAm ekam sharaNam vraja” (give up all dharma and surrender unto Me!). 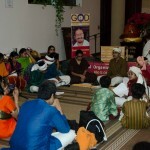 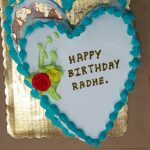 Another special, impromptu celebration was the truly unique depiction of Rukmini haranam episode for the janavasam. 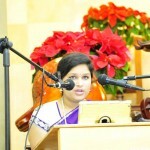 Rukmini pined for the Lord, and a brahmana (the Guru) took her message to Lord Krishna and read it out to Him. 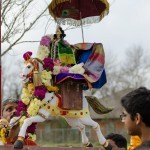 He immediately rode His horse and came with the Guru to Rukmini’s city. 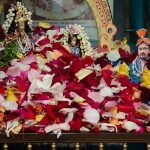 As suggested by her, He then took her away just as she was coming out after her pooja to Kaathyayani Devi. 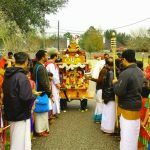 The devotees then joyfully ran fast with Sri Krishna and Sri Rukmini Devi on the horse (kudirai) vahanam and sang numerous kirtans celebrating the Divine Couple. 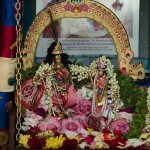 This was done the day before the grand Radha Kalyanam, which was celebrated on Dec 26th to the singing of Ashtapadis and other kirtans. 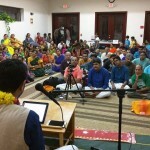 Every evening there was wonderful Srimad Bhagavata Katha by Sri Ramanujamji. 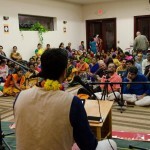 Bhagavatam is a rasika granta (a text to be ‘enjoyed’, more than anything else) and it is said that it should be narrated as well as heard by those who are rasikas. 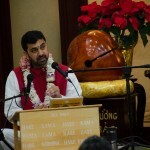 The listeners could tell that Ramanujamji himself was totally enjoying the narration of the nuances of Srimad Bhagavatam, taking his time to expound on various significant slokas and incidents in the text and explaining them through the wonderful commentaries by various mahatmas on those slokas – what more can be said about how much sweet rasa the katha was filled with. 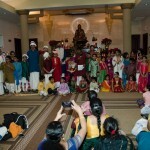 The final two days’ katha of Krishna leela were the icing on the cake and left the listeners wanting for more. 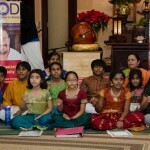 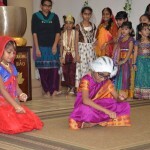 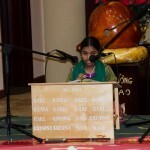 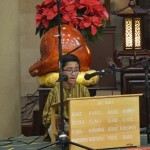 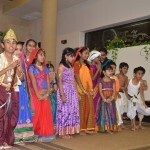 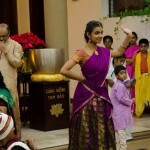 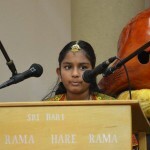 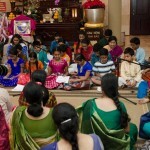 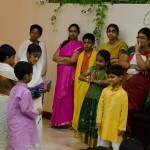 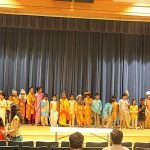 Other special events during the week-long utsav at Namadwaar included celebration of Nandotsavam (with devotees dancing around baby Krishna), Govinda Pattabhishekam and Anna Koototsav, soul-stirring bhajans at night, USA-wide sloka contest presentations, youth cultural programs with several children from Houston and other cities performing Hari Kathas, plays and music programs, and Nikunjotsavam with a special, melodious vocal concert of Sri Oothukkadu Venkatakavi krithis by young Nandini Sridhar, disciple of Sri Chitravina Ravikiran, from Minneapolis. 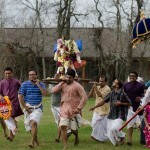 She was accompanied by Houston’s Smt. 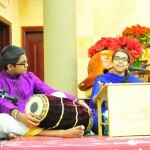 Manjula Rao on the violin and Sri Rajesh Salem on the mridangam. 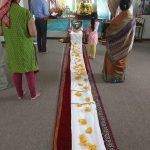 It was an exhilarating week that rejuvenated everyone and inspired all to do more service, kirtanam, katha shravanam and celebrate Bhagavan in their own lives! 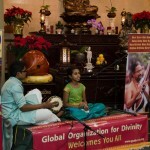 Global Organization for Divinity expresses its heartfelt gratitude to the numerous devotees who came forward to bring a dish or a meal on various days during the week-long event, and also to stores that generously donated groceries and food dishes including Parivar Grocers, Shubhlaxmi Grocers, Swadeshi Grocers, Satya Grocers, Touch of India, East West Grocers and Shiv Sagar restaurant and pray for Sri Swamiji’s blessings for all of them and also for everyone who attended the utsavam. 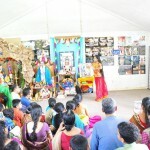 By Sri Swamiji’s grace, it was truly a unique, very joyful celebration here. 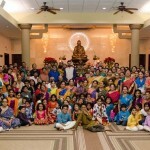 We pray for more and more such satsangs and utsavams with Sri Swamiji’s disciples from India and with all devotees in the US.